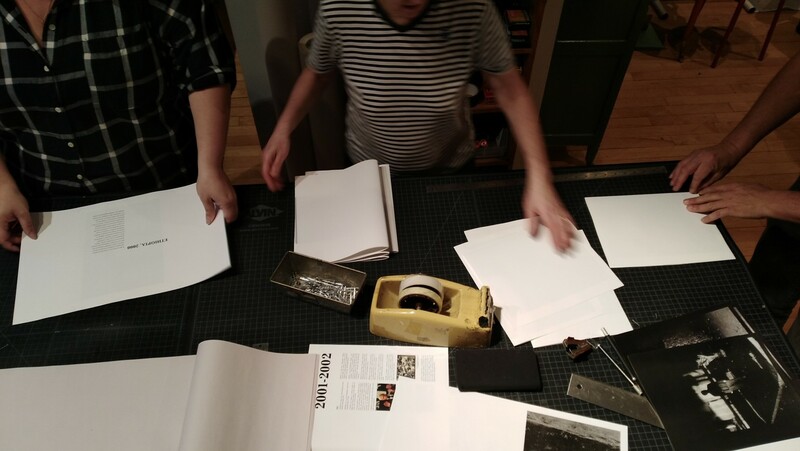 This workshop will teach the process of visual bookmaking and the photography book. In class workshops will teach the process of photo editing, sequencing, story telling and visual pacing. The participants will also explore book formats, page design, typography, and materials. Please bring 30-50 small rough prints (12cm x 18cm) laser printouts are preferred. We will use these photos to sequense the book by hand. In addition, bring one or two finished prints to show the tonal quality of your images. Take photos of your type, make laser printouts (20x25cm). Bring printouts to class. This research will be a jumping off point for the typography in your book. Bring in 2 photo books that you love. We will study the quality of printing, binding, cover treatment. This, along with your found type,become the basis of your inspiration palette.will begin to create your palette of influences. Please bring a Laptop computer with inDesign, Bridge, Photoshop. Scissors, clear tape and double stick tape, glue stick, paper clips, X-acto knife, 24 inch metal ruler. Fashion: 1944-2000, September 11 by Magnum Photographers, Here is New York: A Democracy​ ​of Photographs, Malaparte: A House Like Me, and Sylvia Plachy’s Unguided Tour. In addition to book and exhibition projects, Cuomo designed the film poster for​ Don’t Blink Robert Frank, Paul Simon’s double-platinum record The Rhythm of the Saints; Laurie Anderson’s Bright Red; and numerous books and posters for Twyla Tharp Dance. She received Infinity Awards in the best publication category in 1991 and 2004; and for design in 1995, from the International Center of Photography. She received her BFA from The Cooper Union in 1980 and has previously taught at​ ​ the School of Visual Arts and Parsons School of Design. Cuomo has been adjunct faculty​ at New York University’s Tisch School of the Arts since 1996.